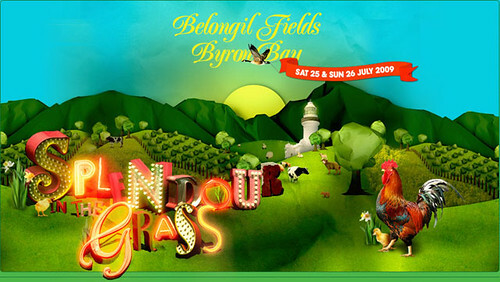 Iâ€™m confirmed to photograph at this yearâ€™s sold-out-in-75-minutes Splendour In The Grass festival down at Byron Bay at the end of July. I think we’re 2 international acts down on last year’s first announcement, possibly a sign of the fall out from the GFC, possibly because in moving the festival forwards a week it’s now the same weekend as Fuji Rock. White Lies are managing to play both festivals but I would have thought it unlikely that many of the other bands would be making the trip over to play in Byron and virtually impossible for any of the bands playing Fuji after the Friday. Japan’s other summer festival, Summer Sonic,Â is two weeks after Splendour, so I’d have thought it more likely that any acts touring over this side of the globe that are added to the bill would be added from their line-up. Big rumour is that a certain female-fronted New York trio that I’d like to photograph will be playing; there is room in their current schedule, although they’d need to be back to play in New Jersey the following Friday, so I’ll believe it when I see it. Either way, Jane’s Addiction, Flaming Lips and Gutter Twins make it a win for me and in terms of the overseas actsÂ I think it’s probably better than last year (even though personally I’m non-plussed about MGMT and Bloc Party – MGMT were hugely unimpressive at The Tivoli in December, as were Bloc Party when I saw them in 2005, plusÂ I can’t stand Kele Okereke’s awful voice). There’s so many better bands that are more deserving of a place on the festival bill and it would be nice for major festival organisers to take some risks and give some exposure to some different bands for a change; they know it’s going to sell out on the first morning so it’s not going to really affect them.Â Â I’m living for the day when Big Day Out or Soundwave puts Sixfthick on their line-up, they would be an amazing band to take on a big tour around the country (and bagsy tour photographer). As for Splendour, I’m not quite sure who I think should be on it as it’s such a varied mish-mash of musical styles, and generally panders to the more mainstream aspects of present day Triple J, although this year seems to have more variety on that front and more of a Generation X slant. Based on the response The Wombats’ power pop got last year, and based on their Troubadour show on Saturday, Screamfeeder would be a worthy addition to the bill, but possibly wouldn’t excite the youth element as much as they should. Giants of Science were outstanding a couple weeks ago, but possibly too heavy for Splendour? Ditto Vegas Kings. Texas Tea for the McLennan Stage? Or too quiet, too acoustic? Andrew Morris? Too low a profile? John Steel Singers? They’d be a good band to put on at Splendour. It’s an even more expensive weekend away than last year was (when tickets were $199 + booking fee) at a mind-blowing $240 + booking fee, a 20% increase in a year. Factoring in accommodation, getting there, food and drink, some people are easily going to spend the best part of $1,000 for a couple of days of music, so I’m always a bit perturbed when people post on forums about how excited they are to see Little Birdy etc when you can go and see them on tour for $20-30 several times a year if that’s your thing. This entry was posted on Thursday, May 14th, 2009 at 1:02 pm. It is filed under Music Photography and tagged with 2009, Belongil Fields, Byron Bay, Justin Edwards, Rave Magazine, SITG, SITG2009, Splendour In The Grass. You can follow any responses to this entry through the RSS 2.0 feed. In it to win it = Dew Process want to sign you?